A picture's worth a thousand words, or so they say. But those words may end up getting shuffled up a bit sometimes, as was the case for the Smith family photo that was circulating after last night's MTV Video Music Awards. The image showed Will Smith and his kids in seeming shock or discomfort as they reportedly watched Miley Cyrus work the stage in a skimpy outfit during her performance with Robin Thicke. 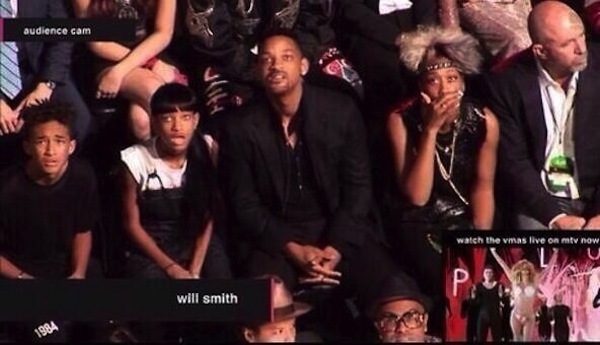 BuzzFeed posted the photo below, in an article titled "Will Smith's family reacting to Miley Cyrus is perfect." Pause it right around the 25-second mark and you'll see something pretty close to the screenshot posted above. Jaden and Willow are rocking out, Will seems to be enjoying himself. And the woman has a nose-itch. Pause it at just the right moment and everyone looks stunned. Unpause it and they're back to enjoying the performance and chewing their gum, the latter of which may have contributed to the awkwardness of their facial expressions in the screenshot. BuzzFeed has since posted an update citing MTV's clarification that they were watching Gaga's "Applause" when this shot was taken. The photo was making the rounds on Reddit last night, which may be where the image and the misinformation originated. Either way, MTV has cleared it up. In the meantime, I'll be completely honest and admit that if someone had a camera on my face last night during Cyrus' performance, I'm pretty sure screenshots would reveal that I was making all of the faces the Smiths are in that photo.